120 Technology Drive • Troutman, NC 28166 info@cronsrud.com | 704.508.7000 | www.cronsrud.com © Copyright 2018, C.R. Onsrud Incorporated. All rights reserved. MMS - 05|2018 Does your machinery work to get smarter every day – learning your business and making it run more efficiently? Does it serve you a daily dose of analytics and reports with your morning coffee to help you make informed business decisions? C.R. Onsrud CNC machines – including the new Qube® trimming machine – are powered by Osync Machine Analytics® to help streamline production, and help minimize unscheduled down time. Call today to grow your #smartbusiness. [F148HM24] HYBRID MILL [F4000X24] X SERIES THANK YOU FOR VISITING US DURING FROM YOUR CNC. N E W 5 - A X I S MODEL! 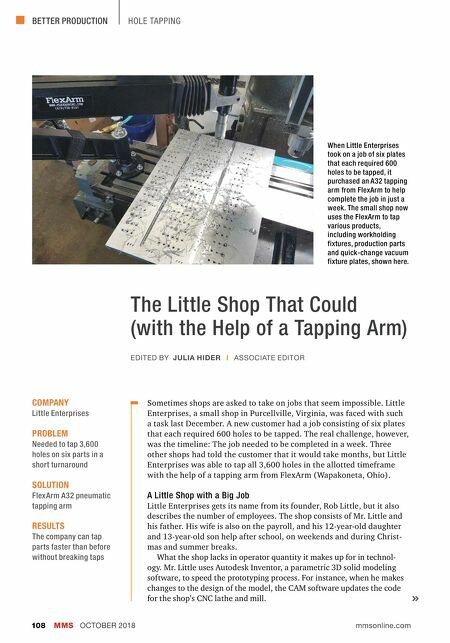 SMARTER GROWTH WITH PERFORMANCE ANALYTICS 120 Technology Drive • Troutman, NC 28166 info@cronsrud.com | 704.508.7000 | www.cronsrud.com © Copyright 2018, C.R. Onsrud Incorporated. All rights reserved. MMS - 05|2018 SMARTER GROWTH WITH PERFORMANCE ANALYTICS FROM YOUR CNC. Does your machinery work to get smarter every day – learning your business and making it run more efficient? Does it serve you a daily dose of analytics and reports with your morning coffee to help you make informed business decisions? C.R. 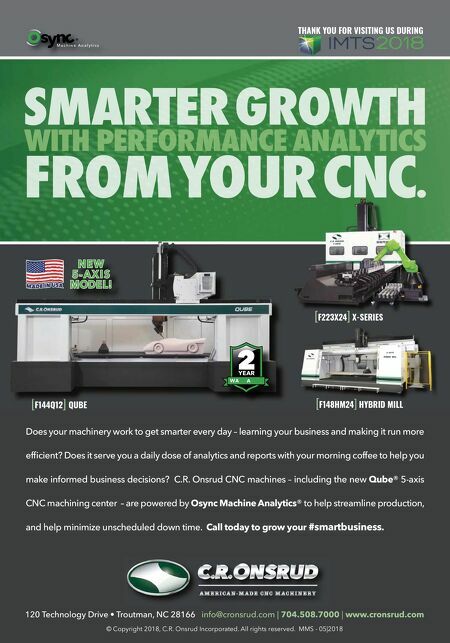 Onsrud CNC machines – including the new Qube® 5-axis CNC machining center – are powered by Osync Machine Analytics® to help streamline production, and help minimize unscheduled down time. Call today to grow your #smartbusiness. [F144Q12] QUBE [F148HM24] HYBRID MILL [F223X24] X-SERIES THANK YOU FOR VISITING US DURING N E W 5 - A X I S MODEL!